Summer may be over, but here in Southern California we are blessed with a bounty of nutritious, delicious (and locally grown) fruits and vegetables all year round. 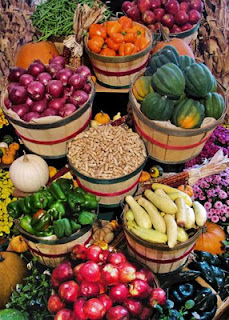 Harvest season is no exception, with vitamin-packed yams and sweet potatoes, winter squash, kale, spinach, cauliflower, apples, pears, citrus, kiwi fruit...I could go on. To help you incorporate in-season produce into your family's diet, check out this listing from Food Fit of fall fruits and veggies complete with nutrition facts and recipes.